Other names for Mosaic Plant are Fittonia and nerve plant. This is a very beautiful plant densely covered with green leaves and silvery white veins on the leaves. The leaves are main attraction of the plant. Other varieties of the plant come with pink, white and green veins. These are low growing creepers and are perfect for bottle gardens. Maintaining a Mosaic Plant garden becomes quite difficult at times. No doubt the plant looks lovely, but it doesn’t survive a slight glitch in humidity. They require consistent and high humidity. The plant also needs to be planted in a corner that doesn’t come in contact with sun directly. The leaves suffer from sun burns within a day of exposure to direct sunlight. Light: Dappled light. If possible fluorescent lights could be set. Water: Both the plant and the soil need to be kept moist. The surrounding should be misted frequently. 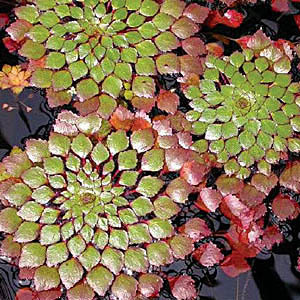 Temperature: Mosaic Plant can survive low temperature. However, average temperature requirement is around 70 degree F.
Fertilizer: liquid fertilizers may be feed, but only during the growing time. New Mosaic Plant branches originate from leaf-tip cuttings. These cuttings are left to grow until they have a minimum of two nodes. The leaf-tip cutting is then separated from the parent plant and potted to a peat based soil mix. On healthy conditions, the plant starts spreading sprout roots from the cutting within two – three weeks. If the temperature is too dry (less than 80 degree F consistently), rooting hormones are used while grafting the leaf-tip cuttings. This is the step in which the successfully rooted Mosaic Plant from the leaf-tip cutting is transferred to another big pot having relatively low density of fertilizer. This is usually done in spring or early summer. It is recommended to have fresh soil each time a plant is re-potted which helps preventing water logging and soil compaction.